I don’t often make this kind of thing at home. I’ll leave the plated dessert nonsense for work, thanks very much (although this is not even close to restaurant-worthy). But R was in Korea for four days this week, and I had too much time on my hands. Also, I thought he’d like having a special dessert when he came home. I’ve called this a “bombe,” but if you’d like to think of it as “baked Alaska,” that’s fine, too. I originally thought to do some version of this as a means to use up some extra sponge cake in the freezer and some yolks in the fridge. I could have gone in any number of directions flavor-wise, but I wanted to send Tartelette one more entry for her Sugar High Friday (an event started by Jennifer The Domestic Goddess) citrus extravaganza, so I settled on a meyer lemon ice cream bombe with orange caramel sauce hiding in the center. If you’re into making ice cream, then this isn’t too complicated if you start the whole process a couple days ahead. Make your ice cream custard and caramel sauce one day, run the ice cream and mold it the next. Then the day of, assemble, make your meringue and plate up! And if you’re not into making ice cream, then I think store-bought would do just fine, and would save a lot of prep. Having cake in the freezer and a silicone semi-spherical mold (like this) in the cupboard helps, too. The ice cream is snappy, and combined with the meringue, is a bit reminiscent of LMP. The orange juice and zest in the caramel help temper some of its sweetness. This is like a self-contained ice cream sundae, and it’s good! Note: If you don’t have a silicone mold, you can put a large scoop of ice cream onto cut cake circles and just serve the sauce on the side. I don’t give a recipe for the cake here, but I used scraps from the jaconde used in my opéra cake (any relatively thin sponge cake will do). Day 1: Make the custard base for the meyer lemon ice cream (recipe below; save your egg whites for the meringue) and chill in the refrigerator. Put your ice cream machine canister in the freezer, if necessary. Make the orange caramel sauce (recipe below) and chill. If you don’t already have cake available, make or buy the cake and freeze. Day 2: Freeze the meyer lemon ice cream base according to your machine’s instructions. Using a spoon, fill the cavities of your dome molds with the ice cream, making sure to nudge it against the side of the molds, and level off each one with an offset spatula or the back of a knife. Lay your silicone molds on a sheet pan and freeze for about 4 hours. Once semi-hardened, using a spoon or a small ice cream scoop, hollow out a cavity in the middle of each mold. This cavity will hold the caramel sauce, so be sure to leave enough ice cream “cushion” around it. Press plastic wrap against the exposed surface of the ice cream and return the molds to the freezer overnight to harden. Day 3: No more than a couple of hours before serving, cut out cake circles using a round cutter that matches the diameter of the bottom of the mold. Take the tray holding the silicone molds out of the freezer. 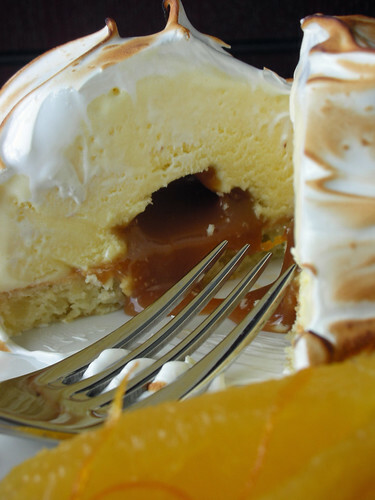 Using a spoon or a squeeze bottle, fill the cavities in of each bombe with orange caramel sauce. Lightly press a cake circle onto each bombe, and pop out of the silicone mold. Place back on the sheet tray, cake side down (the caramel shouldn’t leak out). Return the tray to the freezer. 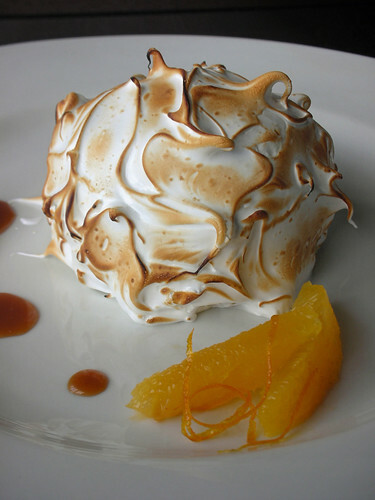 Prepare the Swiss meringue (recipe below) and use a small offset spatula to cover the bombe. Either brown the meringue with a kitchen blowtorch, or bake in a preheated 500°F oven until meringue is deep brown in spots, turning the sheet pan as needed for even cooking, about 3 minutes. Transfer to plates and serve (or you can return the bombes to the freezer for up to a couple of hours, if necessary). Note: The xanthan gum in the recipe is optional, and helps keep ice crystals from forming as the ice cream sits in the freezer. It is a powder and can be found in most health food stores. -Take about half of the sugar and put into the bottom of a 2-quart heavy saucepan. Add the lemon zest and rub into the sugar using your fingers. Add the cream, milk and salt to the pan and bring just to a boil, stirring occasionally. Take off the heat and set aside for about ten minutes to infuse the flavor of the zest. -Beat yolks and the remaining sugar well in a large bowl, then add hot sweetened cream in a slow stream, whisking. Pour custard into saucepan and cook over moderately low heat, stirring constantly with a wooden spoon, until a candy or instant-read thermometer registers 170°F and custard coats back of spoon, about 10 minutes. -Pour through a sieve into a clean bowl, then stir in meyer lemon juice. Cool custard, stirring occasionally, then chill until cold, preferably overnight, before freeing in an ice cream machine. –In a medium saucepan, stir together the sugar, syrup, salt and water until the sugar is completely moistened. Wash down any sugar that is stuck to the side of the pot with a wet pastry brush or wet fingers. (Sugar granules on the side could cause your caramel to crystallize.) Allow it to boil undisturbed until it turns deep amber in color (380°F.). Immediately remove it from the heat and slowly and carefully pour the hot cream into the caramel. It will bubble up, so stand back. -Use a whisk or wooden spoon to stir the mixture until smooth, scraping up the thicker part that settles on the bottom. If any lumps develop, return the pan to the heat and stir until they dissolve. Stir in the butter and the orange zest and juice. Cool. Store in a jar in the refrigerator. Note: If you are afraid you will not be able to work quickly enough rather than pull out the full tray, you can remove the unmolded bombes from the freezer and meringue them one by one, returning each one to the freezer before removing the next. -Combine sugar and egg whites in large metal bowl or the bowl of a stand mixer. Set bowl over saucepan of gently simmering water and whisk until mixture is hot to the touch and all the sugar has dissolved, about 2-3 minutes. Remove bowl from over water. Using the stand mixer fitted with the whip or a handheld electric mixer, beat meringue at high speed until very thick and billowy and room temperature, about 2-3 minutes. -Place sheet tray with unmolded, assembled bombes on work surface. Mound 2 heaping tablespoons meringue atop ice cream on 1 cake round. Spread meringue evenly over to cover, sealing meringue to plain cake border and swirling decoratively. Repeat with remaining desserts. woah MAMA! It’s just so beautiful!!! Wow, just wow. Absolutely amazing! My goodness! I want to live next door to you! That looks absolutely delicious! Yum! You say this isnt restaurant worhty! I disagree. This is stunning. I agree with everyone above: this is Beautiful, restaurant-worthy, AND I want to be your neighbor too! At first I saw the picture, wow! Nothing more to add! Meyer Lemons – what a great choice! I like the “self-contained” ice cream sundae idea. Thanks for sharing this with us. Oh you are blowing me away with this bombe! Steph this looks too good! ooooh, that caramel sauce is killer! understatement of the day: this is a fantastic dessert. i would pay many hard-earned dollars for just a taste. stellar work. Oh YUM! That looks absolutely divine. Now, if I only had three days to put it together! I’ll have to make do with drooling at your photos, drat! That is really fun! I love it! Wow, this is spectacular. I have never tried making a bombe. you have inspired me to give it a go. Not only does this sound incredible it is STUNNING! I am so impressed and you are officially my hero for the day! I agree with Courtney, this is restaurant worthy. So beautiful. 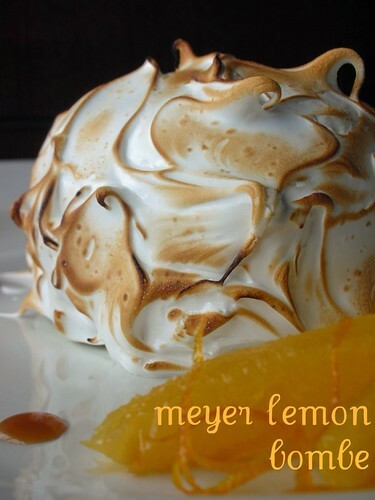 I so totally dig the idea of meyer lemon ice cream. This thing looks mighty tasty, I tell you. Soo beautiful! your bombe is the bomb…okay really corny, but your bombe is stunning!! That’s all I need to say, haha. Wow. Er, I want. I love the whimsical look of your meringue! Wish I could have a bite! Wow, that is a work of art! Love the meringue! Not restaurant worthy? I don’t know where you work but these are simply gorgoeus! Love the caramel orange sauce inside! My God! I almost had a heart failure when I saw the inside of that bombe! And that meringue, what a work of art! Amazing! The swirls in the meringue are so gorgeous! So very nice! Your meringue is perfectly browned! What a gorgeous dessert! Fabulous! Need I say more…………….except that if this isn’t restaurant worthy I don’t know what is. Exceptional dessert! Wow – I’ve wanted to make something like for quite some time. It’s beautiful! Oh wow – this looks and sounds delicious! You have one lucky husband. wow, that is really something!! looks delicious, much nicer then any bombe I have had before!! what an amazing dessert to have at home, my husband drew the short straw with me hehehe. Wow! This makes me want to go out and buy an ice cream maker!!! It just looks SO amazing!! !